Isn't this illustration adorable? 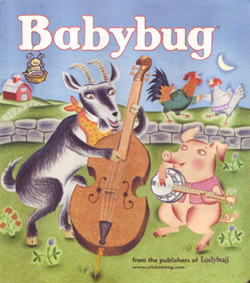 It's the cover of the latest Babybug -- a junior-junior version of Cricket (if you remember that) for 1-3 year olds. We got Emily a subscription right before her 1st birthday when I got a good price on it through the mail, and she loves every little issue. They're like little books, and mostly are really cute and not too painful to read and re-read. (With a few notable exceptions.) This cover is by far my favorite illustration we've seen so far! The artist, Holly Berry (for real!) also does a two-page spread inside that's great, it could totally be from an old Golden Book or something. I found out very little about her, but she's illustrated at least a dozen children's books, (check out this page from The Impudent Rooster! So pretty!) some of which will definitely be going on Emily's wishlist!